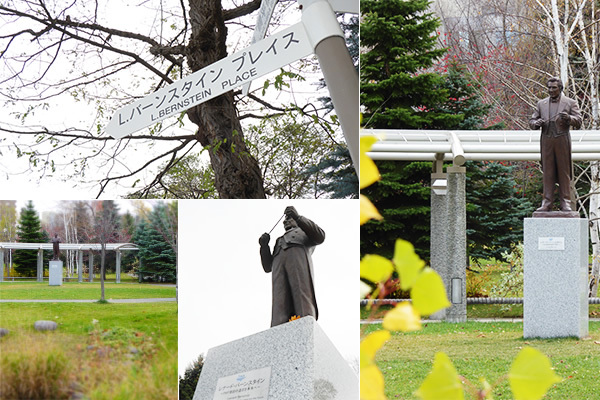 On July 21, 2014, “Bernstein Place,” a new symbol of PMF's inspiring history, was born in the midst of Sapporo's beautiful summer season. 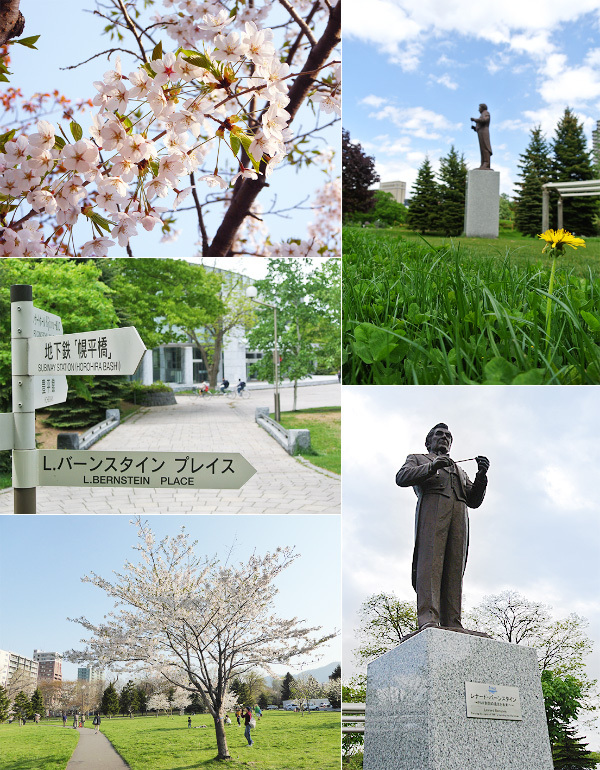 Here, in the heart of the city, in Nakajima Park with the Bernstein Statue, the richness of Sapporo's natural environment and the changing of the seasons can be clearly felt. This series, showcasing the varying seasonal aspects of Bernstein Place, originally ran in PMF MUSIC PARTNER from 2014 to 2015. In this first part of the series, we bring you Bernstein Place in late autumn. Half a year has now passed since Bernstein Place, the new symbol of PMF, was established. Seasons change, and the Leonard Bernstein Statue currently shines in the silvery snow. Nakajima Park is now softly blanketed with snow. Children can be seen cross-country skiing and sledding on the park grounds. In this, the second in the series, we bring you the snowy visage of Bernstein Place. Cherry-blossom season finally reached northern Japan in early May. With the snow completely melted, a vibrant display of life bursts forth as Bernstein Place is greeted by Spring for the first time, surrounded by a colorful array of trees and flowers. This month we bring you the Bernstein statue bathed in Spring light. July: PMF season in Sapporo. A complete cycle of seasons has now passed since Bernstein Place was created. 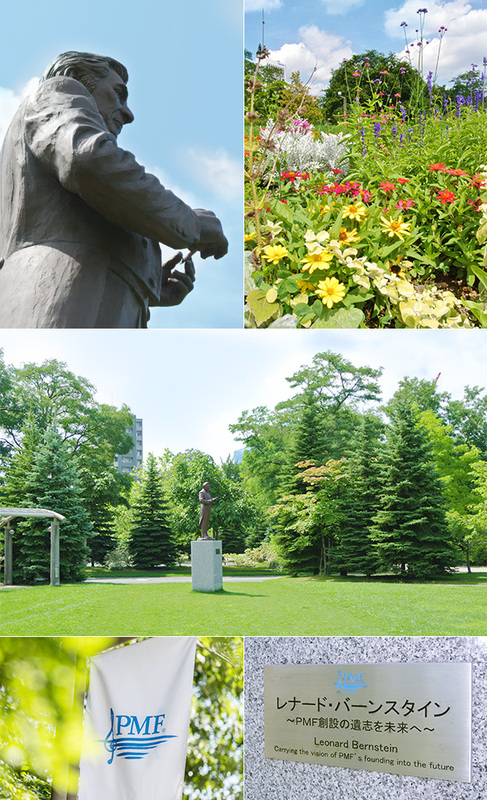 It's as if the clear summer sky, brilliant sunshine, and vividly colored trees and flowers are all extolling the Bernstein statue. In this edition we bring you Midsummer Bernstein Place. 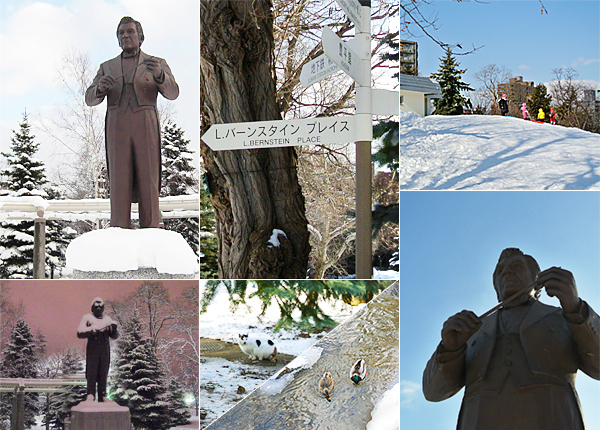 In Nakajima Park, facing away from the main entrance of Sapporo Concert Hall Kitara, take the small footpath diagonally to the right and cross the stream. The Leonard Bernstein statue stands there, in the center of a round courtyard (Bernstein Place).